The Rapid Induction Area Heater is the perfect combination of warmth and ambience for your outdoor living space. Weve designed this unit with a patented heating system to increase airflow, which expands heating coverage for you and your guests. Connect the propane tank and conveniently store it at the base, light and enjoy! The control knob allows you to adjust the settings to your desired flame size for hours of warm relaxation. This HEA-215110CVR free standing heater uses radiant infrared energy that requires no gas or other flammable fuels; it can be plugged into a standard 120V AC wall outlet and is water and dust resistant. Infrared heat is safe for the environment with zero carbon monoxide emissions and hardly affected by wind, making this unit cost effective and environmentally friendly. With double power wattage settings it can be set to radiate 750 or 1500W; it also comes with a remote control. The Hea-21288LED-BK triple wattage hanging gazebo heater diffuses radiant infrared energy that requires no gas or other flammable fuels; with 2 individually activated infrared lamps provides 700, 800 and 1500 watts. It can be plugged into a standard 120V AC wall outlet and is water and dust resistant. Infrared heat is safe for the environment with zero carbon monoxide emissions and hardly affected by wind, making this unit cost effective and environmentally friendly. Remote control provided. Hook and chain are included; also a functional and decorative LED light at the base of the unit. 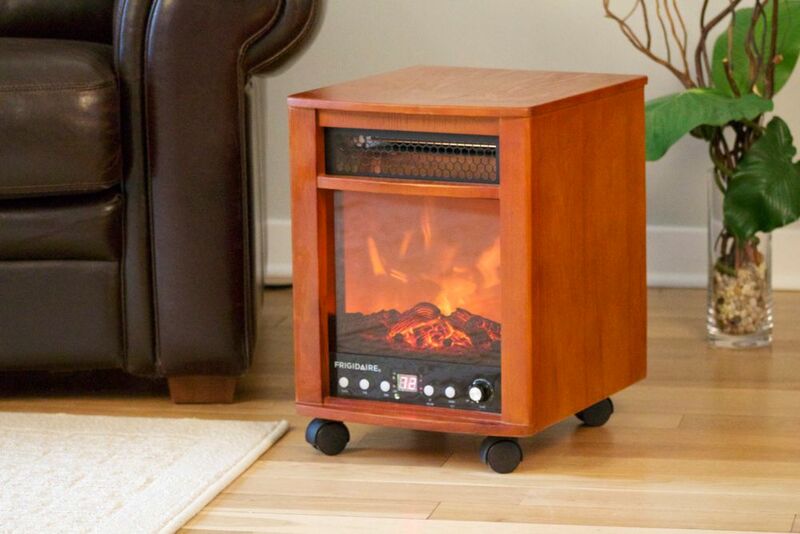 Chicago Full Featured Infrared Heater with Remote Control and Variable Flame Effect Setting the standard in efficiency and design the Frigidaire<sup></sup> infrared heater is a welcome addition to any living space. Its wood grain cabinetry and adjustable flame effect will add a touch of realism and elegance to any room. Newly engineered heat distribution chamber is combined with a full range of features and controls allowing you to quickly fill your room with evenly distributed heat, maintaining a comfort level that best suits your individual needs. The remote control allows you to choose heat settings, adjust room temperature via built in thermostat, set electronic timer and select temperature display. Safe for children or pets, as elements are not exposed. Light weight and easy to move, it rests on 4 swivel casters. The Frigidaire<sup></sup> infrared heater will provide you with years of comfort and efficiently controlled heat as it adds a charming ambiance to your living space.